Small, decorative ceramic tile from Jerusalem, Palestine. 5-1/4" diameter. Has wire for hanging on a wall. 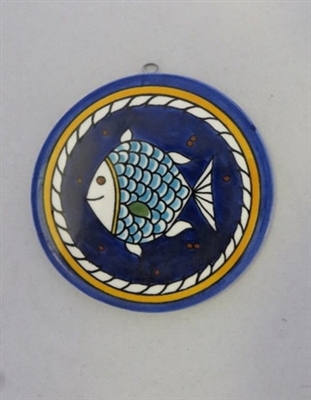 Jerusalem pottery is all individually hand painted and fired in the studios and kilns of the Karakashian family, following a family tradition since 1922.